Long, hot summers are a classic setting for English fiction - humid, languid days of relentless heat seem to create the perfect, oddly dreamlike environment in which the normal rules of behaviour can be suspended, reality put on hold. 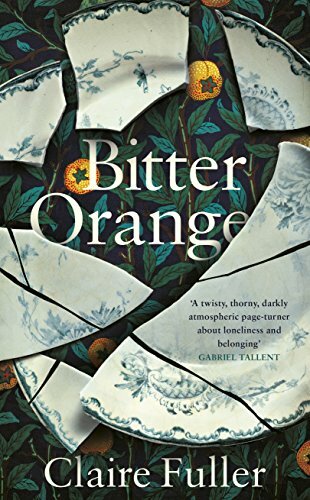 Claire Fuller's Bitter Orange takes places in just such a summer, but juxtaposes the heat and sunshine with the dark, chilly decay and shadowy corners of a dilapidated country house to create an unsettling tale of obsession and envy. It's 1969 and Frances Jellico, a socially awkward, friendless 39-year-old spinster finds herself alone in the world after the death of her resentful, overbearing housebound mother. She arrives at Lyntons, a now empty mansion, in order to survey the historical features of the grounds for its new American owner, but finds herself effectively camping out in a grim attic room, her hopes of discovering a Palladian bridge dashed. however, also staying at the horribly neglected house are Peter, the handsome antiques expert engaged to value and itemise its contents, and Cara, his beautiful, mercurial young wife. Immediately drawn to the charismatic, bohemian couple, Frances quickly finds herself falling under their spell as they take her under their wing. Frances - a woman so constrained and repressed by her past that she wears her dead mother's girdle every day - is introduced to wine, Italian food, cigarettes and an entirely new, carefree lifestyle by her new friends, and is giddy at a potential chance to reinvent herself. But Cara and Peter are not all they seem, and Lyntons itself appears to hold some sinister secrets of its own. It's clear that Cara's obvious instability and the intensity of Frances' obsession are a dangerous mix, and there's a heavy, ominous atmosphere that hangs over this hypnotically gripping story like a dark summer storm cloud. Frances herself is not, perhaps, a particularly easy character to like, but it's impossible not to feel sympathy for her, particularly when she begins to reveal more about the mother whose locket she wears every day, but who never bothered to replace the stock picture of a child it contained when she bought it with a picture of Frances herself. Her disappointments and humiliations are almost painfully believable. I was concerned at the beginning of the book that Peter and Cara, seen from Frances' skewed perspective (quite literally, in fact: she spies on them in their rooms through a gap in their floorboards) would never seem like real people to us as readers, but Fuller cleverly gives us hints through Frances' narrative that flesh them out for us, however oblivious Frances might be to what her own observations truly reveal. Bitter Orange is exquisitely written, rich with vivid detail and packed with brooding ambiguity. Like Fuller's previous novels, Our Endless Numbered Days and Swimming Lessons, it has an unnerving sense of impending - and past - tragedy that also makes it a truly gripping mystery. We may only be up to August, but I'm confident this will be one of my favourite reads of 2018. Thank you to the publisher, Fig Tree, for sending me a review copy.